Club Fabrika is located at No 115 Despot Stefan Street, near down town and represents synonym for an amazing party. For several decades in the world, there is a well known trend of converting big industrial objects into a place for entertainment. This is how club Fabrika is created. In this way are created many clubs, such as club Bergheim in Berlin and club Fabric in London, which are on some way, defined the interior of club Fabrika in Belgrade. Club Fabrika is located in abandoned industrial zone, which allows all the visitors to have until 05 am, without disturbing the neighborhood with loud music. As far as interior of the club, it`s quite minimalist and very functionally divided into zones, respectively there is an entrance lounge and a party zone. 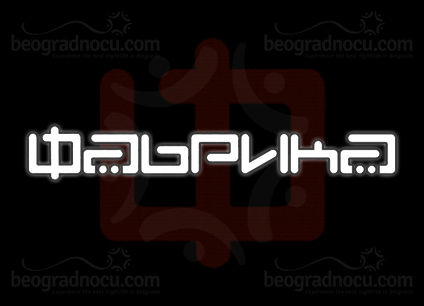 Indubitably, this club owns visual identity, which couldn't be compared with any other club in Belgrade. The specific thing about this club is very good acoustic, allowing a quality sound, which is very important, because club Fabrica will be the host for international dj sensations, bringing the spirit of Ibiza in Belgrade. Club Fabrica is very spacious and offers an opportunity of enjoying at the large bar, booths , and for those who wants a little privacy – a party in gallery above. The gallery of this club can receive about 200 hundred people and it’s convenient, if someone wants to celebrate important moment, like birthday or something similar. Music in this club is mostly disco and house, depending of the day you choose for going out in this club. For instants, pop rock nights are every Tuesday. The whole concept of club Fabrica is to move boundaries of usual urban events in Belgrade and offers a memorable party for visitors in Belgrade.